The new G280DX is a guitar with outstanding features and a synergy that makes the whole greater than the sum of its parts. A superbly versatile instrument that can cover a huge range of sounds, genres and styles, the G280DX is for the pro-level guitarist who seeks performance and reliability without the unnecessary frills. 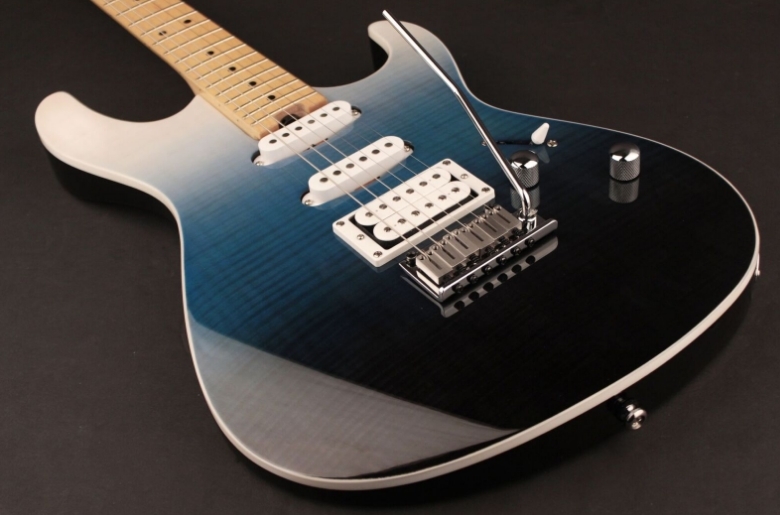 Cort’s engineers put in a lot of thought into keeping things simple while providing maximum versatility for the seasoned player who is more interested in a wide range of expression with his hands than with a plethora of switches and knobs. The guitariste.com in France has published a thorough review (both written and video) of this exciting new model that provides boutique features and performance at a down-to-earth price. Please check out the review from the Guitariste.com. The G280DX is available in two colors: JSS (Java Sunset) and NN (Nordic Night) with the Nordic White featured in this review. Premium grade Alder body mated with a Flame Maple top delivers rich midrange warmth with a touch of cutting brilliance. The Canadian Maple neck and fingerboard provide strong and punchy fundamentals as well as rock solid stability and ease of playability. The matching color headstock adds a high-end boutique vibe to the overall look of the instrument. Cort’s own R&D department developed the Voiced Tone humbucker and single-coil pickups which deliver a wide range of classic and modern guitar sounds – from vintage warmth and sweetness to modern aggression and power. Based on many years of research as well as through consultation with world class artists, the Voiced Tone pickups not only sound great but provide the elusive musical character that players know when they hear it. The hardware is the final piece of the puzzle that pulls it all together. With the stainless steel tremolo bridge that enhances sustain while providing a solid and punchy tone as well as staggered locking machine heads for exceptional tuning stability, every detail has been thoroughly thought out to improve the performance and reliability of the guitar. The spoke nut hotrod truss rod makes neck adjustment a breeze and allows you to fine-tune the neck bow to exactly where you want it.